Edinburgh: Printed by A. Neill and Co.
Monro tertius (1773-1859) held the Chair of Anatomy at Edinburgh University for about 50 years, initially in tandem with his father, Monro secundus. Tertius’s reputation as a teacher was not great, which was perhaps an unfair assessment. However, Charles Darwin was a student of his, and lamented Monro’s ‘dull’ teaching style, and dirty habit. This volume contains various publications bound together. The plate showing a child with hydrocephaly accompanies one of Monro tertius’s many publications. Interestingly, during his career, he dissected the corpse of the ‘body snatcher’, William Burke (1792-1829), and afterwards wrote a letter in Burke’s blood. 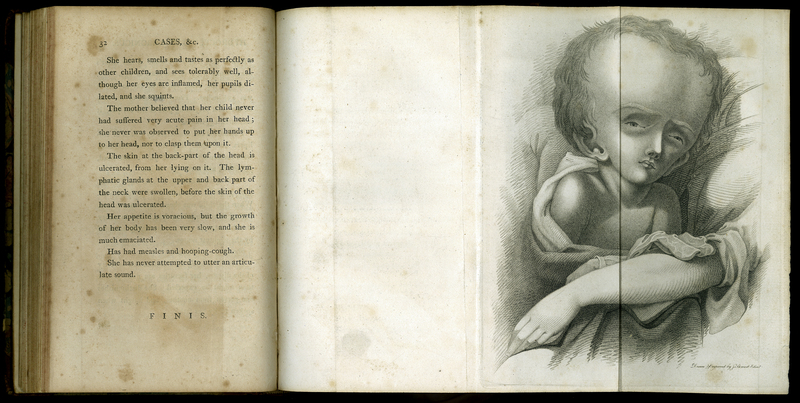 Alexander Monro, Jun., “Observations on Hydrocephalus Chronicus,” ourheritage.ac.nz | OUR Heritage, accessed April 22, 2019, http://otago.ourheritage.ac.nz/items/show/11216.